As a social media manager, I get asked a lot of questions about what exactly it is that I do. Many people, who aren’t in this industry, believe that I play on my phone all day or take Snapchat pictures for stories. This belief is wrong. Social media marketing (SSM) is always evolving. Meaning, I constantly have to evolve, and I always have to plan. A portion of my time is spent researching updates, new trends, new updates, best practices for social media management and so on. Let’s dive into some research that I’ve been doing. Let’s get to it, and please bear with me as social media is like a black hole that sometimes light comes from. Before the update, we could change the title, meta description and images of our posts (in the red box). This allows us to use images that could potentially target our audience better, use titles that maybe are a bit more eye catching and use language in the meta descriptions that appeals to that specific audience. After the update, this is no longer possible for anyone, including those third party social media scheduling tools we (social media managers) are so fond of. When Facebook curates content for the post, it is pulling original copy and images from the website the content is coming from. 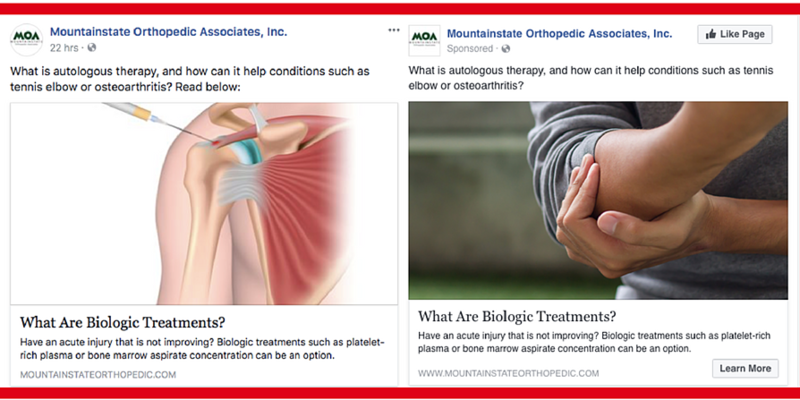 Sometimes, the images attached to the site aren’t sized correctly for Facebook, the titles are keywords, and the meta descriptions are basic knowledge. What was Facebook’s reason for developing this update? To combat fake news. While is is great because fake news can do no good in this world, this update poses certain challenges for marketers (the not being able to change the media). How can we get around this, and what is my personal belief on why Facebook developed this update? To drive marketers to Facebook Ads Manager. You can get around not being able to change the content by creating individual ads in Ads Manager. Social media managers are not strangers to Facebook marketing; however, it has created a certain hassle. 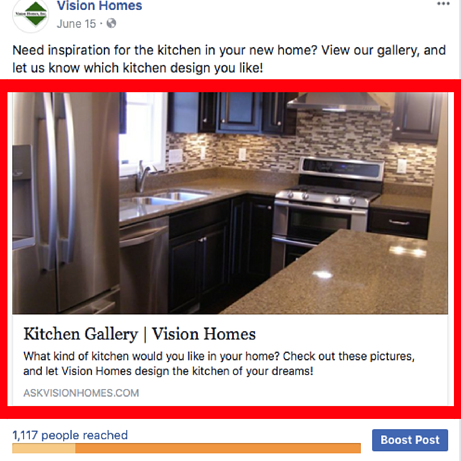 Instead of making advertisements from Facebook posts, we have to create individual advertisements and risk not getting engagement on a client’s Facebook page. This is an example of the same content, but with different images. One is a Facebook post and one is a Facebook advertisement. I won’t get into the details of Facebook advertising, but you can read a previous blog I wrote on it. Does this update mean that it’ll stay this way? I can’t fully answer this; however, I can say with confidence that Facebook is making continuous changes in light of the current situation. Did anyone notice that Facebook went down for “regular maintenance” yesterday (10/11/12)? Yeah, me too. It was down for more than 20 minutes. I think that Facebook is hearing our complaints and trying to appease some of us. One change that they made (didn’t last long) was that to advertise mobility on Facebook, we would have had to advertise on Instagram as well. This update lasted all of one day, I think. Instagram advertising is a tough one for me, and I really think it depends on what your audience demographic is. How can we utilize on Instagram marketing for small businesses? On Instagram, we can accomplish brand awareness, promoting educational content and conversions. One thing that I think is important to mention is having the ability to monitor Instagram engagement from Facebook. It’s almost like Facebook wants you to stay on Facebook, am I right? Something that we at InnerAction Media are delving into is LinkedIn. Some of our clients are engineering firms, and the best way to reach their audience is through a social platform like LinkedIn. This platform gives us the ability to insert ourselves into groups that we already know are interested in the subject. Read more about LinkedIn and what we think about it, here. Social media marketing is like a maze. It starts off dark, and you don’t know where you’re going. You will make mistakes, and you’re going to take a wrong turn. Sometimes, it will feel as though you are doing nothing right; however, if you learn from your mistakes and think logically--you will get through it. It is trial and error, which is why research and staying current on updates can only help you. Here at InnerAction Media, we are dedicated to staying true to best practices and researching new ways to market our clients. We’re always excited help with a new social media marketing strategy! If you think you need help with marketing your business on social media, give us a call.